If it was possible, I'd hunt every day... I love it. I love being in the woods and experiencing all of the things that come along with it. Unfortunately, my schedule doesn't allow me to. Not only do I teach, but I also coach a fall sport (football), and I have a young family that demands a lot of time as well. As a result, I've had to become very selective in the times when I get out to hunt. My favorite times of the season to be in the woods are early archery, November 1st - 15th, and late muzzleloader seasons. Early archery because the deer aren't spooked yet and it is the best time to be able to watch deer. 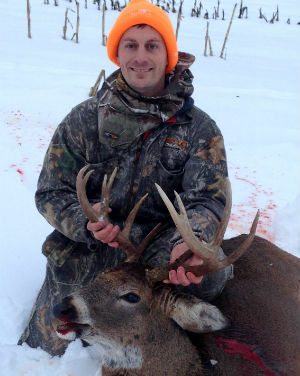 The first half of November because it is your best chance to catch a big buck in daylight, and late muzzleloader because the deer seem to drop their guard in their search for food. This season, archery and the rut came and went with very little action for me. I knocked down a couple of mature does (1 during early muzzle, and one during rifle season) to fill the freezer, but I didn't see much for antlers. 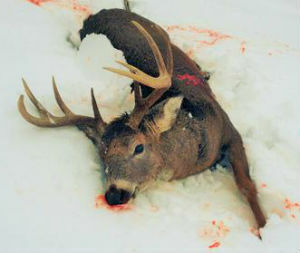 For my favorite hunting partner, my brother Jason, it had been even worse as he didn't see much of anything all season. Late muzzleloader was our last opportunity. It just so happened that this year was also one of those years, weather-wise, that made the last day of late muzzle nearly perfect to hunt a particular property we hunt. On Sunday, December 14, 2014 it was about 40 degrees. This meant that the snow, which had been a constant on the ground for nearly a month, was melting enough for the deer to dig down to the ground in the cut cornfields that cover this property and find the leftover kernels from the October harvest. This property sits on a giant ridge extending up about 400 vertical feet above the Black River. It is all cornfields and small funnels of mature hardwoods with a few swampy areas that seem to hold the deer during the main phases of hunting season. When my brother and I arrived at this property around 1:50 PM, our whole plan was to try and get him in a spot where he could put a little venison in his freezer. After talking to a buddy that hunted this area a lot more than us, we decided to walk up the ridge in one of the front cornfields and have my brother sit in the southwest corner (or top right as you walk up) because a friend had seen deer feeding in this field a few times that week.There were numerous stands on the property, but none in the exact spots we wanted to go, so we decided to sit on the ground...which is rare for both of us. After dropping him off in this corner, I continued up the hill through a neck of woods to the next field on top of the ridge. This was a Christmas stocking-shaped field that was about 500 yards long and between 100-200 yards wide. When I entered the field I crossed it diagonally from the northeast corner to the western side of the field and tucked in about 5 yards deep into the woods just off the field at a high point so I could cover more ground. These woods were about 60 yards wide and ran up the whole length of the western side of the field I planned on watching. I could see most of the field but only shoot about 25% of it. By the time I found my spot and matted the snow down in between two thick maple trees, so I could move around between them without making noise, it was about 2:30 PM. The first half hour of the sit was quiet until a lone doe walked out at the far end of the field around 3:15. I text my brother to let him know that the deer were starting to make their way into the field. While watching the deer through my scope I caught out of my peripheral vision another doe bounding away from me in the woods. I wasn't sure if she busted me or something else spooked her. As I first approached the buck. 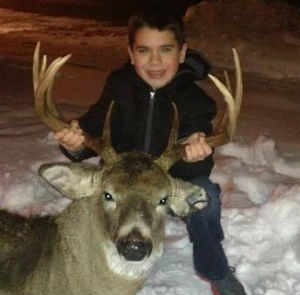 Josh's step-son Levi with the buck. At 3:45 things started to really heat up. Probably the deer that I saw bounding away (though I'm not really sure) came walking back towards me on the far side of the woods. I saw her from about 75 yards out and watched her through my scope as she got closer and closer. At 50 yards, I actually pulled back the hammer on my T/C Omega in case she came so close that it would be an easy shot. I had tags for a doe or a buck and this was a nice mature doe. She stopped at 40 yards and bedded down directly across the woods from me. Not an optimal position. It wasn't a clear, easy shot at her and it meant that I now had a set of eyes watching the woods around me. After, I put the hammer back down in the safety position I looked out in front of me (the doe was bedded down to my right if I was looking straight down the edge of the woods). There I saw two little deer. They were either does or button bucks, but regardless they were yearlings. At about 40 yards I could see them clearly and they were fun to watch for a couple of minutes as they played around before they moved out into the field. Once the fawns entered the field I could see more brown past them in the field. They had sneaked in while my attention was in other places, but I couldn't see them clearly. Then, I noticed more brown movement in the woods back where the fawns had come from. When I looked through my scope I instantly saw antlers. I knew right away that it was a buck... and a nice one. I could see at least 3 nice long tines on its left side. This was a buck that I certainly would be happy to take. Now the challenge was, how do I get a crack at him. I was standing with my gun rested against the right side of the maple between me and the buck, but the problem was that also between us was a lot of brush and saplings. A decent shot with a rifle where I could follow it up quickly, but with a muzzleloader I knew I needed a better shot than that. So, I adjusted to the left side of the tree. When I moved, I noticed that the doe bedded down had spotted me and was now standing up and giving me the old stare down. All hunters have seen it before where it begins with the head moving to different angles to make you out and then a front foot starts to stomp. All I could think about was, "Please don't blow." If she did, it would almost surely spook thie buck and my opportunity would be lost. I shifted my attention back to the buck thinking that if she did blow I would have to work quickly. As I did this, the doe bolted directly away from me on the far side of the woods. No blowing, just bounding off through the woods. With my attention re-focused to the buck, I found him edging closer to the field at about 50 yards. This was a problem because where he was going to enter it, there was a dip where he would drop down out of my sight. Fortunately, I had a decent shooting lane and as soon as my sites found the mark I pulled back the hammer and pulled the trigger of my smokepole. When the smoke cleared, I could see the buck run out into the field. I could instantly see that he had a beautiful rack, that appeared to be a big eight. It looked like he was running fine and I had missed. There was no chance of a fast re-load so I just kept watching him already starting to second guess my decision to shoot when I did. Then, as he got halfway across the field, he started to hobble. I didn't miss him! It continued to get worse and he was slowing down dramatically. He's gonna go down! Finally, he stood up on his hind legs and crashed down on his side like a horse getting shot in a war movie or western. BOOM! Normally, I would have just sent a text to my brother telling him, "I got one, keep hunting, and I'll take care of it." But, I knew instantly this was not just any deer. Instead I called him and when he answered I simply said, "Get up here, I just got a monster!" He responded with, "I'll be right there." By the time my brother got to me I was in the field looking at a beautiful 11-point. It was a main frame 8-point with crab claws on his right G3 and G4 and another on his left G4. A beautiful buck and by far the nicest I've ever been fortunate enough to harvest. He instantly gave me a bear hug, the kind that we've only shared together a few times in our lives, but each time was one of my favorite memories. It's been almost a month now since I got this deer, and both my brother and I joke that we look through the pictures at least once a day. Not only was it a great deer for where we hunt, but it was also just a great experience to share with my brother. A memory that will last our entire lives.